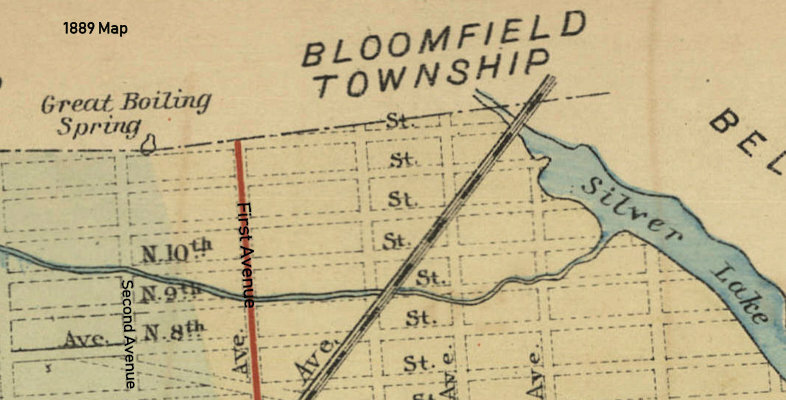 The Great Boiling Spring was on the northwest corner of Second Avenue and North Thirteenth Street where Bloomfield and East Orange meet Newark. It was a shallow pool about 30 to 40 feet in diameter and was feed by the many springs which bubbled up through the sandy bottom giving the pool its name. A stream ran from the pool and contributed to Silver Lake. During the time of its existence the center of the pool was the boundary between the three towns. In 1910 the East Orange & Ampere Land company developed the tract and drained the water through an underground conduit. By 1927 all traces were gone.